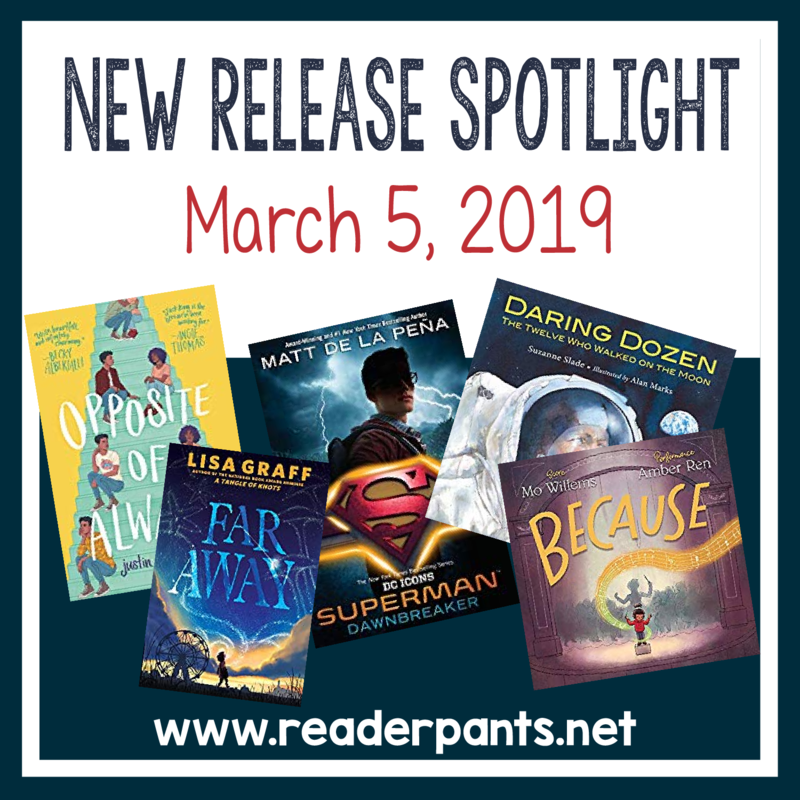 Well, it's a day late, but I just couldn't bear to let such an amazing new release week go without a Spotlight! The past few weeks have not been a good time to live in China. The pollution has been really high most days since early-February, and our VPN access has been practically non-existent since last Saturday. In China, VPNs are necessary in order to access "forbidden" websites like Facebook, Pinterest, Instagram, Blogger, Goodreads, etc. Since my blog was created in Blogger, I haven't been able to access my blog for long periods of time to write up the New Release Spotlight. I've had to do it in little pieces, but it's finally complete! There are SO MANY amazing titles this week. Don't miss new books from popular authors including: Mo Willems, Lisa Graff, Matt de la Pena, Jennifer E. Smith, Geoff Rodkey, and Mac Barnett. Two titles this week have four starred reviews each--not unheard of, but certainly not common. I'm looking most forward to Superman by Matt de la Pena and The Lovely War by Julie Berry. Debut author! When Jack and Kate meet at a party, bonding until sunrise over their mutual love of Froot Loops and their favorite flicks, Jack knows he's falling--hard. Soon she's meeting his best friends, Jillian and Franny, and Kate wins them over as easily as she did Jack. But then Kate dies. And their story should end there. Yet Kate's death sends Jack back to the beginning, the moment they first meet, and Kate's there again. Healthy, happy, and charming as ever. Jack isn't sure if he's losing his mind. Still, if he has a chance to prevent Kate's death, he'll take it. His power is beyond imagining. Clark Kent has always been faster, stronger--better--than everyone around him. But he wasn't raised to show off, and drawing attention to himself could be dangerous. Plus, it's not like he's earned his powers...yet. It's the perfect idea for a romantic week together: traveling across America by train. But then Hugo's girlfriend dumps him. Her parting gift: the tickets for their long-planned last-hurrah-before-uni trip. Only, it's been booked under her name. Nontransferable, no exceptions. Mae is still reeling from being rejected from USC's film school. When she stumbles across Hugo's ad for a replacement Margaret Campbell (her full name! ), she's certain it's exactly the adventure she needs to shake off her disappointment and jump-start her next film. A cross-country train trip with a complete stranger might not seem like the best idea. But to Mae and Hugo, both eager to escape their regular lives, it makes perfect sense. Sixteen year old Nalah leads the fiercest all-girl crew in Mega City, but when she sets her sights on giving this life up for a prestigious home in Mega Towers, she must decide if she's willing to do the unspeakable to get what she wants. Juan has plans. He's going to get out of El Paso, Texas, on a basketball scholarship and make something of himself--or at least find something better than his mom Fabi's cruddy apartment, her string of loser boyfriends, and a dead dad. His best friend JD has plans, too. He's going to be a filmmaker one day, like Quinten Tarantino or Guillermo del Toro (NOT Steven Spielberg). Be sure to the reviews on this one before you buy--they do not all agree. I've included two opposing excerpts below. Sophie is a monster expert. Thanks to her Big Book of Monsters and her vivid imagination, Sophie can identify the monsters in her school and neighborhood. Clearly, the bullies are trolls and goblins. Her nice neighbor must be a good witch, and Sophie's new best friend is obviously a fairy. But what about Sophie? She's convinced she is definitely a monster because of the "monster mark" on her face. At least that's what she calls it. The doctors call it a blood tumor. Sophie tries to hide it but it covers almost half her face. And if she's a monster on the outside, then she must be a monster on the inside, too. Thirteen-year-old Nikki Doyle dreams of becoming a great basketball player like her WNBA idol, Mia McCall. Nikki has always been the best point guard in her county league, and her dreams feel within reach when she's selected to play on an elite-level club team. But in a league with taller, stronger, and faster girls, it turns out that Nikki is no longer the best point guard. In fact, she's no longer a point guard at all, which leaves her struggling to figure out who she is and how she fits in. The first time I heard about Planet Choom, we'd been on Mars for almost a year. But life on the Mars station was grim, and since Earth was no longer an option (we may have blown it up), it was time to find a new home. That's how we ended up on Choom with the Zhuri. They're very smart. They also look like giant mosquitoes. But that's not why it's so hard to live here. There's a lot that the Zhuri don't like: singing (just ask my sister, Ila), comedy (one joke got me sent to the principal's office), or any kind of emotion. The biggest problem, though? The Zhuri don't like us. And if humankind is going to survive, it's up to my family to change their minds. No pressure. Oliver "Spaghetti-O" Jones's dad is about to be jailed for a crime he didn't commit, and Oliver believes the only way to save him is with the help of his favorite lucha-libre wrestler turned action star, Tito the Bonecrusher. Together with his best friend, Brianna (a.k.a. "Brain"), and their new ally Paul "Popcorn" Robards, Oliver devises a madcap plan to spring his dad from a Florida detention center. Heartwarming and hilarious, this book looks at what it takes to be a hero...and what happens when you realize that saving the day might not always be possible. Sal prides himself on being an excellent magician, but for this sleight of hand, he relied on a talent no one would guess...except maybe Gabi, whose sharp eyes never miss a trick. When Gabi learns that he's capable of conjuring things much bigger than a chicken--including his dead mother--and she takes it all in stride, Sal knows that she is someone he can work with. CJ's Aunt Nic is a psychic medium who tours the country speaking to spirits from Far Away, passing on messages from the dearly departed. And CJ knows firsthand how comforting those messages can be -- Aunt Nic's Gift is the only way CJ can talk to her mom, who died just hours after she was born. So when CJ learns that she won't be able to speak to her mother anymore, even with Aunt Nic's help, she's determined to find a work-around. She sets off on road trip with her new friend Jax to locate the one object that she believes will tether her mother's spirit back to Earth...but what she finds along the way challenges every truth she's ever known. Ultimately, CJ has to sort out the reality from the lies. Debut author! Charlie O'Reilly is an only child. Which is why it makes everyone uncomfortable when he talks about his brother. Liam. His eight-year-old kid brother, who, up until a year ago, slept in the bunk above Charlie, took pride in being as annoying as possible, and was the only person who could make Charlie laugh until it hurt. Then came the morning when the bunk, and Liam, disappeared forever. No one even remembers him--not Charlie's mother, who has been lost in her own troubles; and not Charlie's father, who is gone frequently on business trips. The only person who believes Charlie is his best friend, Ana--even if she has no memory of Liam, she is as determined as Charlie is to figure out what happened to him. A young girl and her cat take an imaginative journey into another world. Companion to: Triangle and Square. It is planned to be the last in the Shape Trilogy. This book is about Circle. This book is also about Circle's friends, Triangle and Square. Also it is about a rule that Circle makes, and how she has to rescue Triangle when he breaks that rule. This is another one with conflicting reviews. I've included two review excerpts below. With a cleverly simple rhyme and playful, vibrant artwork, Cheryl B. Klein and Tomie dePaola lovingly paint the picture of a baby bird's first flight--overcoming stings and dings along the way to soar triumphantly. On July 20, 1969, Neil Armstrong took one small step and made history. Over the course of the next three-and-a-half years, twelve lunar explorers, including Alan Shepard and Gene Cernan, touched down on the moon's surface. Author and engineer Suzanne Slade reveals how the Apollo missions (1969-1972) built upon one another and led to important discoveries about our nearest neighbor in space. Back matter includes an afterword by Alan Bean (1932-2018), the fourth person to walk on the moon. 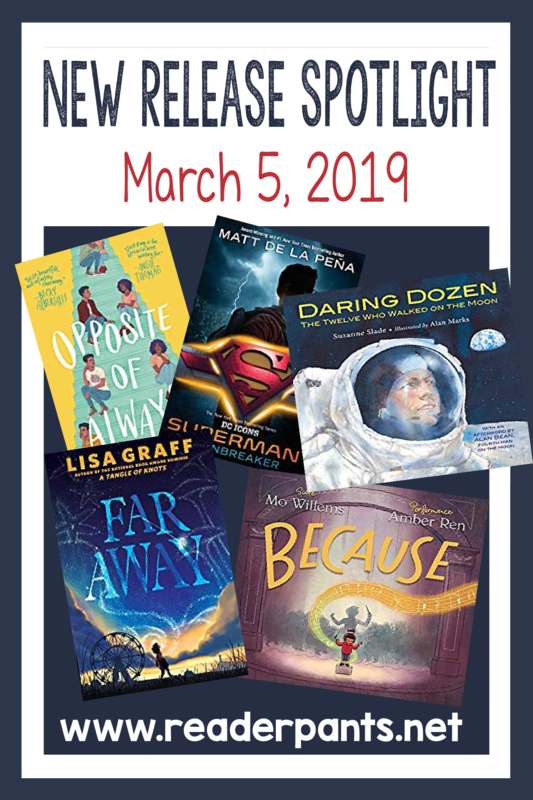 Another week of some great sounding books, good thing next week is spring break for us so I can get some reading done! I enjoy your lists every week. They help me decide which books to buy!